Are you a teen that wants to correct your smile without metal braces? 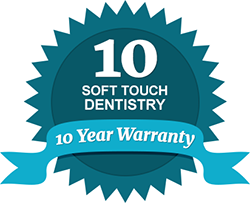 We can help you at Soft Touch Dentistry. Dr. Sarah Thompson is an experienced and highly skilled Invisalign Teen provider. We are a comprehensive dental practice that treats patients of all ages with top quality general dentistry and state-of-the-art cosmetic dental treatments in a warm, relaxing environment. If you have teeth that are crowded, gapped, crooked or protruding, Invisalign Teen can be the perfect solution. This system uses a series of clear custom-made aligners that slowly move teeth into their proper position. Teenagers can now straighten their smile using a discreet, comfortable and fast treatment method. At Soft Touch Dentistry, we offer this invisible clear braces system for teens to help them not only gain a smile they feel confident in, but one that is fully functional as well. Invisalign is successful in treating overly crowded or widely spaced teeth as well as improving more complex issues such as overbites, underbites and even crossbites. Teen patients can expect to receive a new set of custom clear aligners every two weeks until ideal results are achieved. These aligners are not only comfortable to wear and speak with, but they can also be easily removed for eating, drinking, brushing and flossing. Invisalign allows teens to remain diligent to their oral hygiene needs during orthodontic treatment. Invisalign Teen can be the ideal solution for adolescents who need orthodontic correction, but do not want the discomfort and embarrassment of metal brackets, wires and bands. To learn more about Invisalign Teen and if it is right for your teen, contact us today. Dr. Thompson welcomes the opportunity to enhance your smile with a full range of cosmetic dental services, including teeth whitening, clear braces, porcelain veneers and more. Our practice accepts most dental insurance companies and we offer flexible financing plans for your benefit.